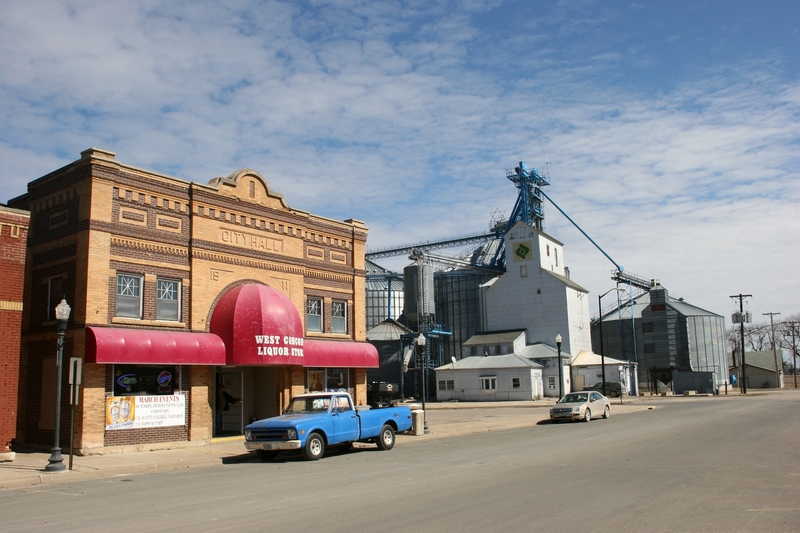 A great ode to an icon of rural america. Thank you. I suppose this could evolve into lyrics. One of the first things I noticed about this picture is the Collector plate on the truck. Most wouldn’t view this truck as a “collector” by definition. But it sure is! I agree, Todd, although I’ll admit to not noticing the “collector” plate. 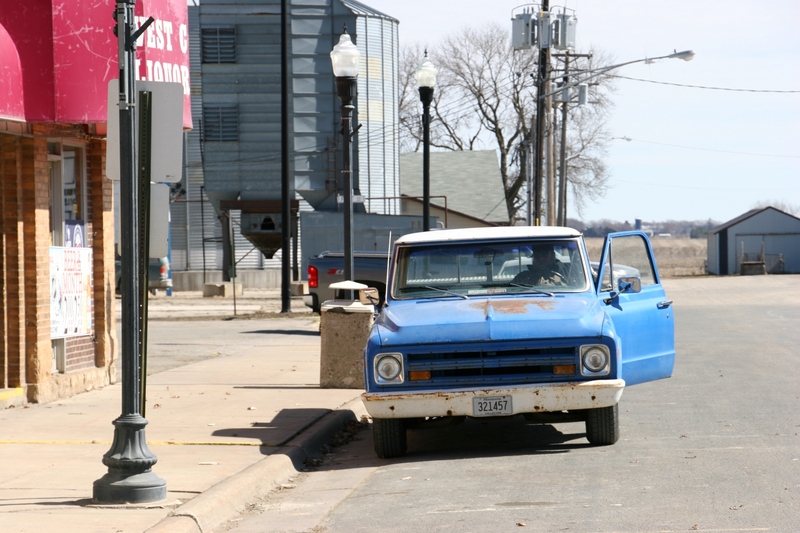 It was the resemblance to my dad’s pick-up truck and the meaning of the pick-up to rural Minnesota that drew me to photograph this vehicle and small town scene. Thanks for stopping by. I have many more sweet surprises coming from West Concord. Stay tuned, Jackie. I have lots more coming from West Concord. We drove into Old Concord. A few houses and a meat locker, as I recall. Oh this brought back memories!! My Dad never owned a new truck. He had a lot of old beaters, but they had character and they were easy to work on and mechanic. Not so with today’s trucks. Each year, one of my favorite laughing moments was opening that floor vent (that was the air conditioning!) after a long winter and all of the dirt and debris blasting into the cab of the truck!! Better not have your mouth open!! Thank you for sharing those memories of your dad’s pick-up truck. Well, then you would love small town Minnesota because this scene is quite common around here. And, yes, that’s one wide street. You can stand in the middle of it and take lots of photos without fear of being struck by a vehicle. 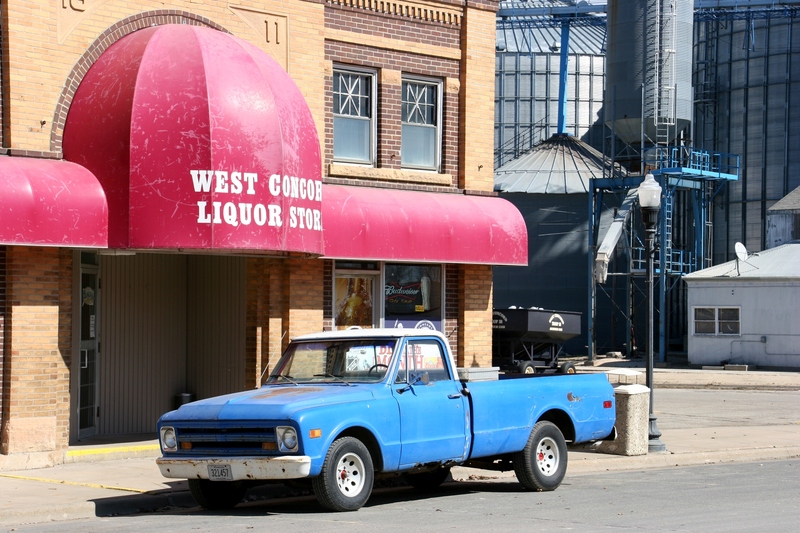 I’m with you — old trucks are great. New is not so bad, except so many of them are gigantic monstrosities. Monstrosities is the perfect descriptive word. Oh Jake. We can count on you for your great observational powers and your witty response!!! It’s just that the “packie”, as we call it up heah, has an almost mystical attention drawing powah. It looks very much like rural Ohio..love the city hall building! Its very deco..
It’s a fabulous building, isn’t it? Next time I’ll have to snoop inside.